Under Section 9607(a)(3) of CERCLA, a party who has arranged for the disposal of hazardous substances at a facility may, like other categories of Potentially Responsible Parties, be strictly liable for response costs. Where the PRP has engaged in the sale of a “useful product,” even one known to be hazardous, is not liable as an arranger unless the PRP has taken “intentional steps to dispose of a hazardous substance.” Burlington Northern and Santa Fe Ry. Co. v. U.S., 556 U.S. 599, 609-10 (2009)(“BNSF”). Mere knowledge that there might be a discharge of hazardous substances in connection with the transport or use of the product is not sufficient to impose arranger liability. Id. at 611. As a result, “whether an entity is an arranger requires a fact-intensive inquiry that looks beyond the parties’ characterization of the transaction . . . and seeks to discern whether the arrangement was on Congress intended to fall within the scope of CERCLA’s strict-liability provisions. Id. at 610. Just such a “fact-intensive inquiry” was undertaken by the United States District Court for the Western District of Michigan last week in Georgia-Pacific Consumer Products LP v. NCR Corp., Case No. 1:11-CV-483 (W.D.MI. Sept. 26, 2013), one of a number of cases dealing with the recycling of “broke,” or scraps of carbonless copy paper coated with a PCB-containing emulsion produced by NCR from the mid-1950’s until 1971. 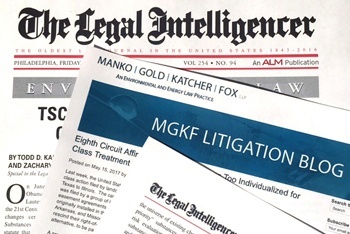 Read the full blog post found at the MGKF Litigation blog.